Not quite sure how this works, but I'm going to give it a try! 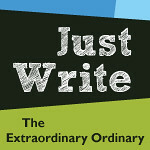 The rules require me to post a six word description of myself and then to tag five co-bloggers to join the fun. I cheated a little bit. I had to use 2 words as 1! I keep lots of balls in the air...but I usually have to run around a lot to actually keep the up there! Hmmm....I don't think I have 5 to tag. I definately have a "do it yourself" complex. I always have. It's just part of my independant nature. Being the oldest of 4 kids, I seemed to naturally take charge of stuff and get things done (yes, I know, sometimes I was called bossy). When I went away to college I did everything--from college applications to financial aid to living arrangements all on my own. I enjoy taking care of things. Fast forward to being a mom. I thrive on being a mom. But, living in So Cal means that I also have to work. 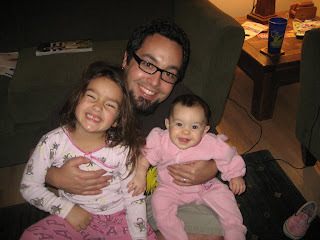 I'm thankful to have a schedule that allows me a few weekdays at home with my kids. I really try to give my kids as much of the "stay at home mom" experience that I had growing up. Baking together, park, playdates, etc. It can get exhausting though. Most days I'm home with them, their naptime is my rest time! For almost a year my husband has worked a second job just to help pay down some debt. He doesn't get home until about 7:30 four nights a week. And his "day job" requires him leaving the house before the girls are awake. So, most of the weekly kid stuff falls to me--which I'm fine with. I love it and I'm appreciative that he's working extra (although he admits my "job" sometimes is harder!). But here's the deal. The circumstances of our life right now requires an element of "supermom-dom." There are many errands that won't get done unless I do them with 2 kids along. My hubby wouldn't even dream of bathing the 2 kids together--which I do all the time. The list could go on. I realized this week thought, that I can take my supermom-dom too far. Case in point. I had a 3-day minister's conference to go to out of town this week. There was childcare provided during the main sessions and meeting. So I figured, why not bring the kids. That way I don't lose time with them. Hubby isn't trying to balance kids with his jobs etc. What was I thinking??? Now--the kids did great. They didn't have normal naps or bedtime, but they didn't really lose it, until the last day. But, it was a chance I could have had some time to myself. In reality, since I'm still nursing, the baby would have come with me--but I could have left Miss Rose at home. Hubby even offered and said he'd work it out--but I refused. I was so exhausted by the end. Most of the meals we eat at restaurants--which required me getting my vehicle (praise God for valet parking) getting the kids in, putting the stroller in, driving, entertaining kids while we waited for food, finding food they would eat etc. Instead of hopping in a van with my co-workers and enjoying adult conversation. So, I've learned a lesson. I am a working mom. And sometimes, it's actually better for my kids if I don't try to include them in everything I do. It's something I need to accept. Maybe I'll get to be a stay at home grandma someday!! Every day I think of a creative way to make money, but be home more with my children. You'd think with all these ideas, I'd figure something out. But, the fact is--nothing is easy money and everything takes work. I guess I just haven't found the right thing that is worth the work and will actually make money. I'm not sure that I ever will. Don't get me wrong, I enjoy what I do. But for me there will always be the lure of being home more, or working from home. I'm sure if money were absolutely no concern--I could find plenty to fill each day with as a mom, caring for the house and the children--oh yeah, and the husband of course. But I have always enjoyed being productive and using my brain. So perhaps the perfect blend for me would be a job I could do mostly at home--naps, nights, maybe only several hours of childcare required. So, here's what's been on my mind. Child resale store--I would LOVE this job. Owning one that is. But there's the start-up and the lease cost etc etc. Maybe one day though! Photography-I love good photos. I don't necessarily know how to take good photos. But I could learn, really I could. photographers make so much money! A few weddings a month or maybe specializing in family/pregnancy/babies would be neat. And could make $$! Homemade baby food-this has been one of my newer ideas. Moms seem to be more and more into healthy stuff for their babies and with the new Magic Bullet I got for Christmas--it seems like it would be fun to make up big batches of baby food and sell it locally. But, I have a feeling that I would have to get permits and have a special kitchen to do it legitimately. Sewing-I like sewing. I'm okay at it. I could get better. But there is a whole slew of people online who sell homemade baby stuff. I'm not sure that what I have to offer would be that much better. Fitness for moms-I've really enjoyed the journey of getting back into shape after my 2nd baby. I'm proud to say I've lost 10lbs extra after each baby--which puts me at 20lbs lighter than when I got pregnant with my first daughter! I guess I would need to get some actual training for this though. Whoops. Naptime is over I guess. Back to real life. 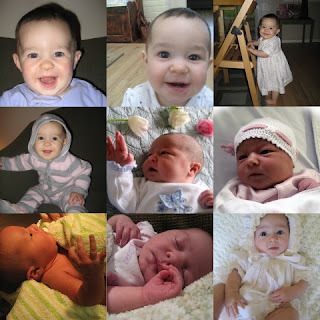 A little collage I put together for Miss Gracie's birthday. 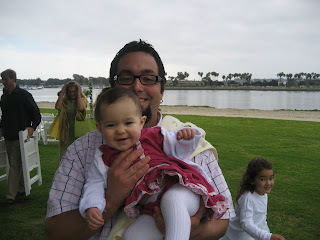 Daddy and Miss Gracie at a wedding. Check out Miss Rose "that guy" in the background! 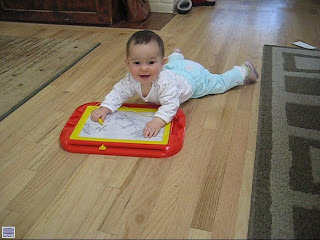 figuring out to draw on the Magna Doodle. Should an 11-month old be able to do that?? I am always taking the photos, so we don't have many of me with the kids. I'll find some soon though. Or have someone take them! Some weekends are like a game of tag in our house. This seems to be one of them. I'm sure we're not the only ones. Maybe by 8 pm we'll get to hang out! The kids will be in bed. But we'll be exhausted!!! And Sundays in our house aren't much better. I keep reminding myself, it's just a period of time in life. It won't always be like this. Roger won't always be working a second job, our children won't always be so small and require so much attention. Miss Rose had her first pets this last weekend, for all of about three days. My cousin got married and they had golfish as part of the centerpieces. We left before the reception was over but my sisters stayed until about the end...when they were giving away the goldfish. And they thought it would be fun to bring them home to Miss Rose. Thanks aunties. Miss Rose was excited--but I was quick to warn her that goldfish don't always live too long. Auntie Z was quick to point out that you know they are dead if they are floating at the top and the fun part is flushing them down the toilet. We don't beat around the bush in my family! All was well until Monday morning. The water was super cloudy and stinky so I changed it. Apparently that is a no-no. I didn't know...I'm not educated in goldfish care. We had several as a kid and they all died quickly (now I know why!) The fish weren't too peppy after that. We got home from the park later that day and Goldie was gone. Sparkles was just laying on the bottom practically. Since she was prepared--Miss Rose wasn't really traumatized. Thank you God!! We got the fish out and prepared to flush it. She wanted to carry it to the toilet. I thought she meant the cup it was in...she wanted to actually touch the fish!! Brave girl. We didn't do that though! A bit later we called Daddy at work to let him know of Goldie's demise. Miss Rose got on the phone to talk about it. Daddy said "I guess Goldie went to fishy heaven." And Miss Rose said "no Daddy, we flushed him down the toilet." At which point Daddy began to laugh uncontrollably but wanted to hide it in case it would upset the grieving 4-yr old. Since he didn't respond she kept yelling into the phone "no we flushed him down the toilet." At the end of the conversation Miss Rose says "well, you know what they always say..."
What? You are 4. How do you know what anyone always says? "Well, you know what they always say...when your fish dies, you just get a dog because they don't die." We absolutely fell out laughing! The kid wants a dog!! Unfortunately our yard isn't fully fenced, and we rent, so it's not an option. Plus there is enough in our life. Oh yeah, Sparkles was sparkling in fishy heaven next to Goldie by the next morning. Thanks aunties. For the lesson in death and dying. I guess it can't hurt to start early!